(Bloomberg Opinion) -- For many years, respected macroeconomists scolded countries that failed to reduce their debt levels. The International Monetary Fund, whose job it is to lend money to poor countries in crisis, long demanded fiscal austerity in exchange for aid. In Japan, economists darkly warned of a solvency crisis as that country’s debt climbed. In the U.S., too, many economists cautioned that the government was borrowing too much. But economists’ views on the subject of debt are changing. Economist Kenneth Rogoff, who once ran into criticism for a dubious claim that debt reduces growth, now advocates more deficit spending for the U.K. The IMF has softened its tone on debt, and is beginning to embrace the idea of fiscal stimulus for distressed economies. And Olivier Blanchard, a respected macroeconomist and former IMF chief economist has a new paper questioning the idea that higher deficits would impose any real cost on the U.S. economy. Blanchard notes, effective borrowing costs may be even lower for the government, since some portion of the interest paid to bond holders gets taxed, ending up back in the government’s coffers. Taking this into account, he finds that during the past half-century, the U.S. almost always could have afforded to take on more government debt than it did. growth rate…Indeed, the trajectory of deficits under current fiscal plans is indeed worrisome. 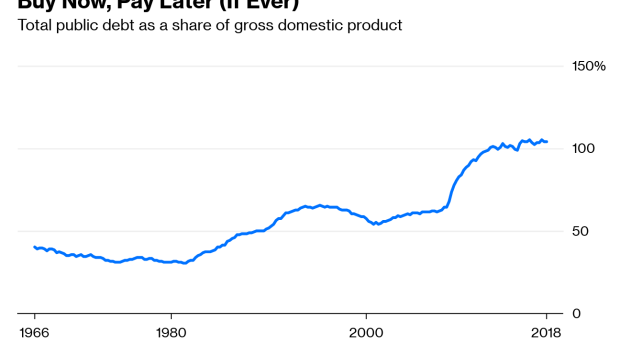 Blanchard ventures that an increase in the debt-to-GDP ratio of 60 percentage points by 2043, which some economists currently expect, would be enough to push interest rates above the long-term expected economic growth rate. If that happened, the case for more debt would then evaporate. But Blanchard’s model doesn’t take into account the possibility of a compliant Federal Reserve. By buying government bonds, the Fed can keep both long-term and short-term interest rates as low as it likes, for as long as it likes. Of course, if the debt was never paid down, the Fed would have to keep rates permanently at or near zero in order to pull off this trick, effectively tying its hands forever. This sort of condition is referred to as fiscal dominance, and it would represent the end of central bank independence. Japan is probably already in this situation. The real danger of ever-increasing debt, even with a compliant Fed, would be the risk of inflation. To many, this seems laughable, as the U.S. hasn’t experienced high inflation since the '80s, and since a hyperinflationary collapse like the one suffered by Venezuela seems impossible in a country as advanced and stable as the U.S. But if the U.S. government changed from fiscal conservatism to all-out deficit expansionism, that calculus could change. So it seems like the optimal policy lies somewhere between the extremes of fiscal austerity and explosive deficit spending. The government can afford to add some debt -- say, another 60 percent of GDP -- to its books with little danger. But 60 percent is less than infinity, and there will probably come a time when fiscal prudence will have to reenter the conversation.